MASHED is a unique festival to be held at the Oxford Art Factory on Sunday November 20 this year, and is sure to become a yearly fixture in the future. Initially conceived to help fund the current revamp of the COFA campus, MASHED has been appropriated to fund for the COFA student association, helping students to find a voice and follow their passions in order to bring more events that showcase the supportive learning environment of university culture. A one-day event, it aims to transform the famous venue into a centrefold brimming with the creative juices of the student collective residing in the UNSW campus of The College of Fine Arts (COFA). Beginning with the Markets from noon to 5pm, you might find quirky stationery, exotic food, and unique art pieces in amongst the stalls. During the markets, live music and art will be performed and exhibited. This is the perfect opportunity to get over that late Saturday night, or simply have a fun and enjoyable time with the kids, or with your better half. Take the time to also enjoy live brush-off competitions between artists in an act that celebrates the spontaneity of street art. Furthermore, the space will be used to its limits with full utilisation of both stages musically as well as use of the walls, doubling as an intimate, personable art exhibition showcasing COFA's newest talents. With a focus on collaboration, the festival aims to be a source of inspiration, to let the audience enjoy not only the Arts, Music and Markets individually, but also experience the creativity that abounds, alive in between all these artistic mediums. And it is sure to impress. 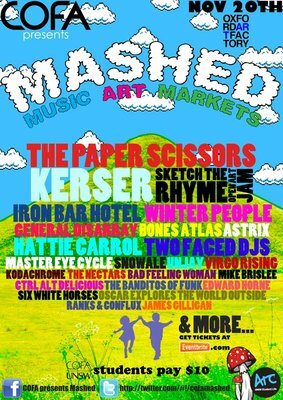 MASHED features an eclectic lineup of music, from the folk of Winter People, to the indie garage funk that resides in national crowd-pleasers The Paper Scissors, to blues, hiphop, rock and dubstep. Comfortably easing into the night, you can catch the bigger music acts at an affordable price of $20 (or less if you are a university student) from 7pm onwards. Experience the famous grungy, dark and ambient feel of the Oxford Art Factory for yourself and you'll understand why it is frequently cited as a premier staple in the live alternative music scene. With the recent boom in Sydney's festival culture, this one surely promises to stand out as a contender for a local winner. Cost: $20 ($10-15 for students) after 7pm.